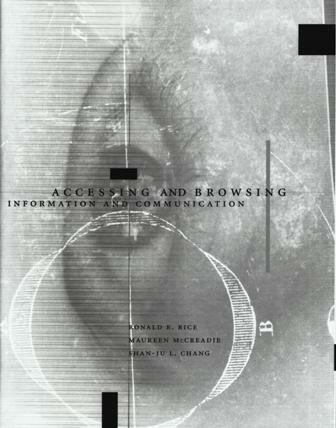 Rice, R.E., McCreadie, M. and Chang, S-J. The basic argument of this book is two-fold. First, accessing and browsing resources are fundamental human activities, considered in a variety of ways and under a variety of terminologies across a variety of research areas. Second, they are insufficiently understood or identified in any particular research area or service situation, so that unidentified aspects, or uninspected biases, prevent people from providing, and obtaining, the desired or necessary resources. This book reviews literature from a wide range of research areas on these two fundamental human activities -- accessing and browsing resources. Further, it considers two fundamental human resources -- information and communication. These reviews are used to identify common and unique perspectives of each of the research literatures. These perspectives are integrated to develop preliminary frameworks that are both more general and more comprehensive than any particular research area's treatment of the concepts. Then, using multiple sources of evidence, these preliminary frameworks are evaluated, refined, and validated. Access-Related Issues in Several Relevant Research Areas, What are They? Research Question Two: What Are the Influences and Constraints on Access to Information? Research Area that Lead to the Differences among Them?